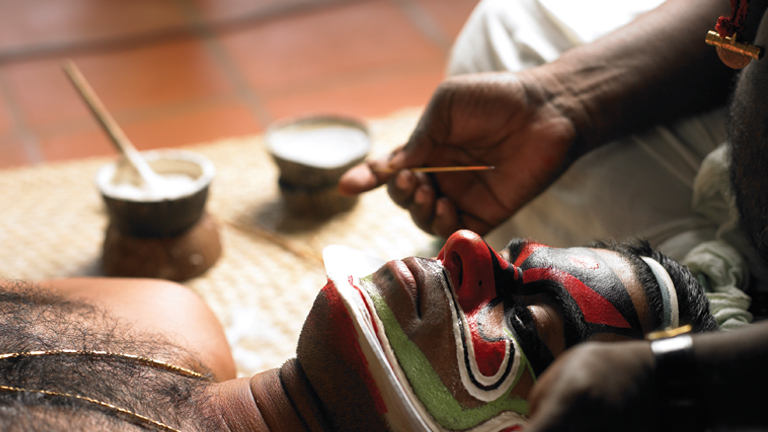 Mukhathezhuthu signifies the painting of the artistes’ face in ritual art forms. You can see Kerala’s folk painting tradition clearly reflected in Mukhathezhuthu that is a necessary part of various art forms such as Mudiyettu, Theyyam, Thira, Kalikettu, Kaliyoottu, Thullal, Kathakali, Krishnanaattam, Kudiyattam, Koothu, etc. The techniques traditionally followed include Pullittezhuthu, Shankhittezhuthu, Hanuman, Kannittezhuthu, MaanKannittezhuthu, VattaKannittezhuthu and Anchupulliyittezhuthu and so on. Mukhathezhuthu is done in keeping with the emotional makeup of the deity the artiste represents.